the end of 2014, a few months after Intel would launch their Haswell refresh platform for the LGA 1150 socket. 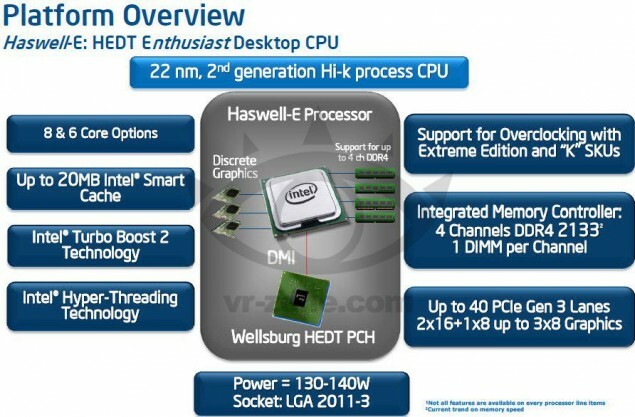 IPC improvement over quad cores with their flagship Haswell-E processors. memory upto 2667 MHz, Unlocked PCH and PLL voltage controls and more. feature built-in graphics but someone buying such an costly processors will definitely go for a discrete GPU for graphics. directly connected. The new DDR4 memory modules consume only 1.2 V of power compared to 1.65/1.5V standard with DDR3. The can feature upto 16 banks of memory and require a 288-Pin DIMM connectors which would be available on the new X99 chipset motherboards. The DDR4 memory controller offers Quad channel memory support. DDR4 would offer faster clock speeds and the Haswell-E platform supports frequencies o 2133 MHz, 2667 MHz O.C +. the engineering sample we saw listed on EBay months ago. T-HPHS air cooler with the LGA 2011-3 socket for Haswell-E processors. performance. On the mainstream platform, Intel would release a Haswell refresh platform which would feature support with LGA 1150 socket based on the Z97, H97 chipsets in Q2 2014. Images are courtesy of VR-Zone!